Having been lifted up, bound and thirdly the stretching of the bow. On the nineteenth Jude was killed with arrows. Of Christ's disciples O Jude, and suffering. For who else should I fashion a crown Thaddaeus? Said your eye-witnesses as an initiate of the Word. 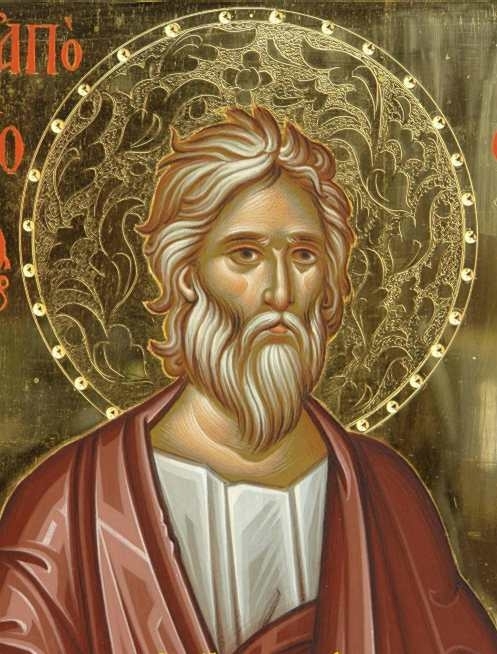 The Holy Apostle Jude was one of the Twelve Disciples of the Lord. Although he bears the same name as Judas Iscariot who betrayed the Lord, in English his name has been shortened to Jude, while Judas is the Greek translation of the Hebrew name Judah. The New Testament distinguishes him with various names. "Jude of James" is only mentioned twice in the New Testament: in the lists of apostles in Luke 6:16 and Acts 1:13. The Epistle of Jude states that it was written by "Jude, a servant of Jesus Christ and a brother of James" (Jude 1:1). 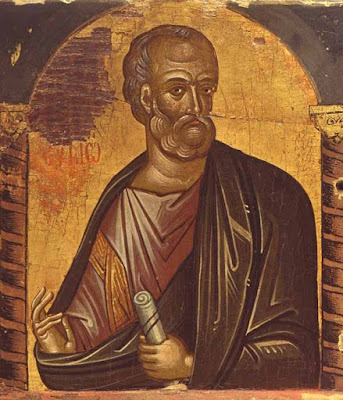 This James was the brother of Jude and of the Lord and the first Bishop of Jerusalem, who was martyred by being thrown from the pinnacle of the Temple. The Gospel of John also once mentions a disciple called "Judas, not the Iscariot", who asks Jesus, "Lord, how is it that You will manifest Yourself to us, and not to the world?" (John 14:22). This is often accepted to be the same person as the Apostle Jude. In the apostolic lists of Matthew 10:3 and Mark 3:18, Jude is omitted, but there is a Thaddeus (or in some manuscripts of Matthew 10:3, "Lebbaeus who was surnamed Thaddaeus") listed in his place. This has led many Christians since early times to harmonize the lists by positing a "Jude Thaddeus", known by either name. This is made plausible by the fact that "Thaddeus" seems to be a nickname. While Lebbaeus means "ardent", for Jude united himself to Jesus with all his heart, Thaddaeus means "he who renders praise", for he glorified and rendered praise to Christ. 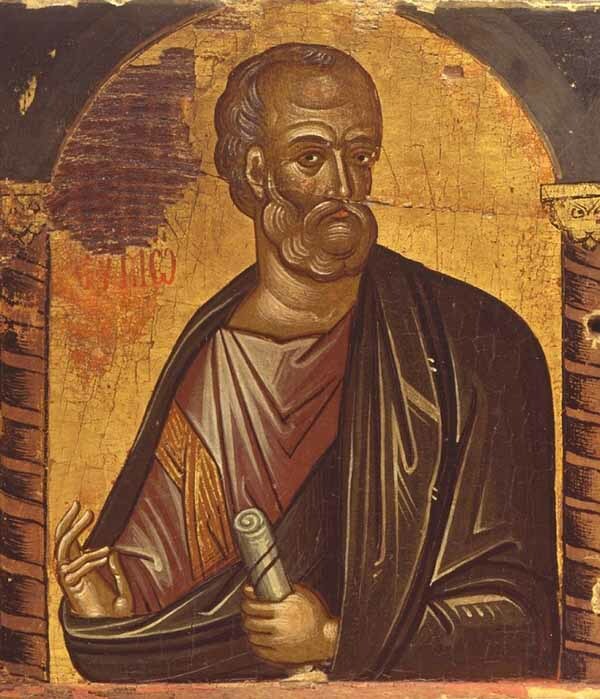 Thaddeus, one of the Twelve Disciples, is often indistinguishable from Thaddeus of Edessa, one of the Seventy Apostles who converted Edessa and delivered the image of Christ Not-Made-With-Hands to King Abgar and is celebrated on August 21st. Jude was the son of Joseph, who was betrothed to the Theotokos, whose actual mother was Salome, daughter of Haggai, the son of Barachiah, a brother Zechariah, the father of John the Baptist and Forerunner. In John 7:5 we are told that Jude, being one of the brothers of Christ, did not initially believe in the message of Christ. John 14:22 may indicate that Jude did come to believe in Christ's message before His Holy Passion. Conscious of his former sins of lack of faith and brotherly love, he later wrote: "Jude, a servant of Jesus Christ and a brother of James" (Jude 1:1), not daring to call himself a brother of the Lord, but instead confessing that He was the Lord incarnate without an earthly brother according to the flesh. Jude married a woman named Mariam, and we are told by the historian Eusebius that during the reign of Dometian (81-96) two grandsons of the Apostle Jude were brought before the emperor himself, who based on the slanders of heretics was afraid they posed some political danger to him. When the emperor examined them and saw that they simply toiled in the working of the land, he set them free as they posed no danger to him. The historian Nikephoros Kallistos Xanthopoulos writes of Jude: "The divine Jude, who had the dual title of Thaddaeus and Labbaeus, the son of Joseph and brother of James who was cast down from the pinnacle of the Temple of Jerusalem, preached the gospel and disseminated Christianity first in Judaea, Galilee, Samaria, Idumaea, and afterwards in Arabia, Syria and Mesopotamia. Finally, he came to the city of Edessa, which belonged to King Abgar, where the gospel had been preached before him by another Thaddaeus, one of the Seventy Apostles. There, the Apostle Jude set about and completed what had not been finished by that Thaddaeus." Laboring in this manner for the enlightenment of the pagan peoples and converting them from their former superstitions to the light of the true knowledge of Christ, he made his way to the lands around Mount Ararat, where he converted a multitude of people to Christianity. Having stirred up the pagan unbelievers, there they seized him and subjected him to tortures. Then they hung him up and shot arrows through him. In this way he delivered his soul into the hands of God, and received from Him the unfading crown of martyrdom. We know thee as Christ's kinsman and martyr, and praise thee with sacred chants. 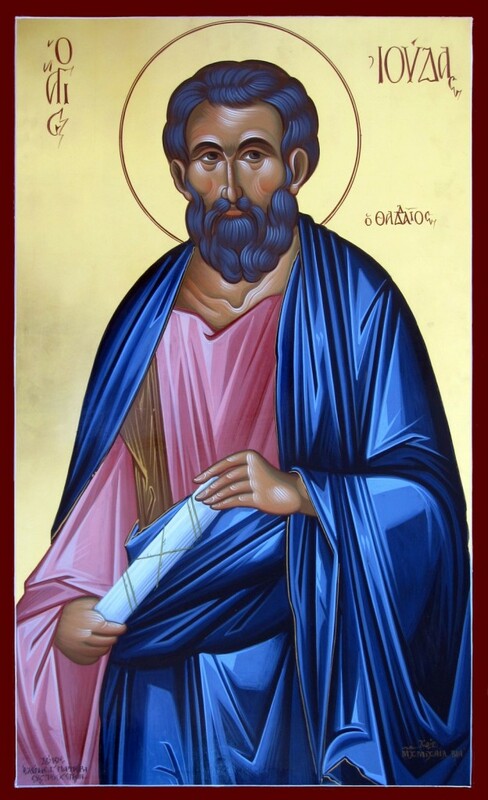 O Apostle Jude, thou didst trample on error, and preserve the faith. As today we celebrate thy memory, through thy prayers may our sins be forgiven. Thou hast sprung as a divine branch from a noble root, O Apostle and Brother of God, wise herald of Christ and the Lord's eye-witness, thou hast nourished the world with thy words, and as the Lord's initiate thou dost teach the Orthodox faith. Come, let us acclaim the Apostle Jude, as the Master's kinsman and the initiate of His truth; for he sowed the glad tidings in tears and labors, but reaped a godly harvest in joy and blessedness.